This past February, I ordered thirty 2-pole, 2-position switches from Mouser Electronics. They were out of stock at the time and the company gave me an estimated shipping date of June. Well, that put the dispatcher's panel on the back burner for a while. And I was a little uncertain as to whether or not the parts would ever actually arrive from the manufacturer in Taiwan. In fairness to Mouser, I received an email from them every month with an updated shipping date, and it continued to show as June. Then earlier this month I received the email- the parts would be shipping soon! Last week, a big box arrived, and in it were- you guessed it- all of the switches. A quick test fit in the panel was successful and the Rix Products CTC knob fit on the shaft snuggly. Success! Well, at least as far as getting the turnout switches. 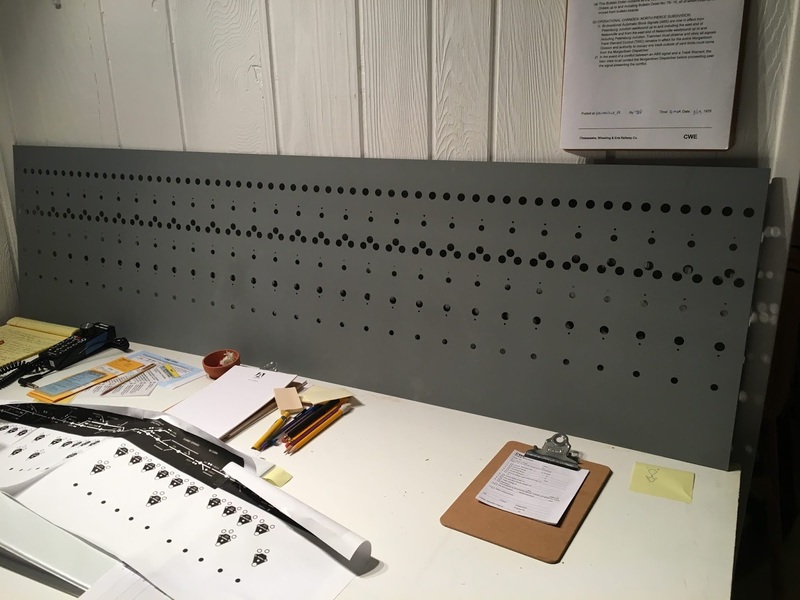 The arrival of the turnout switches provided the incentive to order the rest of the parts for the front of the panel, including all of the LED's for the turnout and signal levers, the pushbuttons for the code buttons, and the LED's for showing occupancy on the board. I order all of these from Rail Logic Technologies and here's a link to their website: https://www.logicrailtech.com/. As Rail Logic was out of the Rix CTC kits which contain the levers, plates, and pushbutton covers, I ordered them directly from Rix Products. Here's a link to their website: http://rixproducts.com/. A special kudos to Rick Rideout on this one. I ordered the parts on Friday and they were delivered on Monday. And Rick even threw in a couple of extra kits! Also this past February, good friend Randy Seiler cut down the panel, removed the rust and primed the surfaces for me as I mentioned in this post: https://cwerailroad.blogspot.com/2018/02/the-panel-has-arrived.html. The photo below shows the panel after Randy's work. Once the panel was trimmed and primed, I worked up the design for the cabinet. I spent a bit of time looking at prototype photos in order to get a sense of what size the track diagram should be. It will be located above the panel and will include track occupancy detectors. Using PowerPoint, I developed a complete panel which can be seen in the photo above. The next step was to determine how to convert the PowerPoint presentation into something that could be used to engrave the diagram. And this was a real struggle. After numerous conversations with folks who have had panels engraved in the past, including a conversation with the company in Dayton, OH that Gerry Albers used for the V&O panel on his Deepwater District, it became apparent that I wasn't going to be able to find a graphics program that would work for me. So the project remained on the back burner. 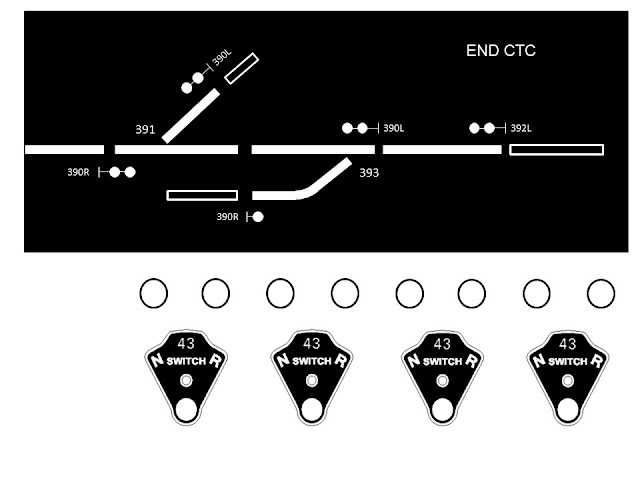 After I received notice that the rotary switches were on the way, I started thinking about the track diagram again. And it the solution finally occurred to me- use the same technique that I used for all of the panels on the railroad. It would be relatively simple to match the PowerPoint presentation to the width of the panel. Once the pages lined up correctly with all of the signal and switch levers, I could simply print them on Avery full-sheet labels, apply a clear coat to protect it, and then mount them on a piece of 1/8" Masonite. The thickness of the Masonite would approximate the thickness of the material that would be used for engraving the track diagram. So if I ever find a way to replicate the drawing in some software package, swapping it out for the Masonite would be easy. The photo below shows one of the pages from the presentation. The critical piece to this is making sure that the track diagram is spaced correctly for the holes in the panel. The holes above the switch plates match up perfectly with the panel. I will also be able to print out the entire track diagram and make sure that each page break lines up correctly. So the next step is to begin construction of the cabinet. And while that's underway, I'll also be working on the electrical diagrams. Working with Gerry Albers on his Deepwater District railroad and his Signals By Spreadsheet products has been an incredible blessing and I believe I'm finally at a point where I have the knowledge to make this thing work. We'll see! 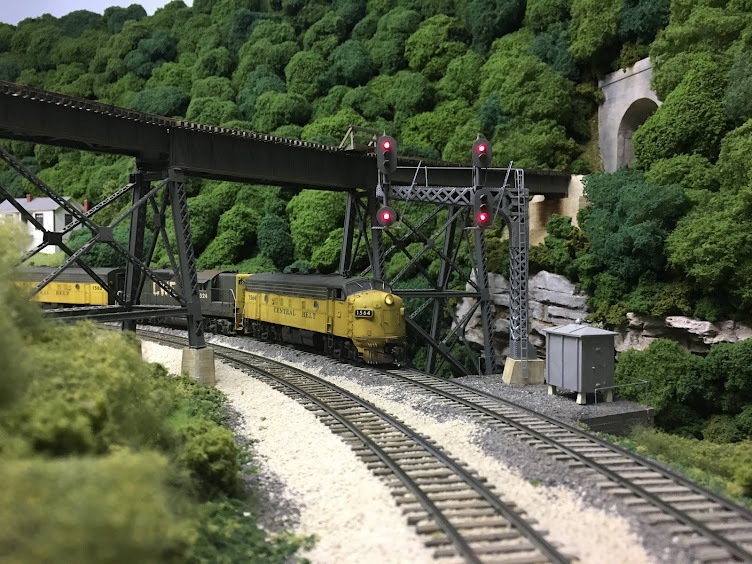 Does your friend Bill Ford have blog or is there any information on his O scale C&O Cabin Creek branch on the web? Sorry- I don't think so, at least I haven't seen anything.